North Korea is holding up to 120,000 political prisoners in “horrific conditions” in camps across the country, according to estimates from a newly released State Department report. The department on Tuesday issued its annual International Religious Freedom Report for 2017, which covers 200 countries and territories, documenting religious freedom and human rights abuses. The findings on North Korea come as the Trump administration is working to engage the isolated regime. The White House says the administration continues to “actively prepare” for a possible summit with Kim Jong-Un. The report, though, addressed the brutal conditions festering inside Kim’s kingdom. It revealed 1,304 cases of alleged religious freedom violations in the country last year, while detailing the harsh treatment of political and religious prisoners — and persecution of Christians. 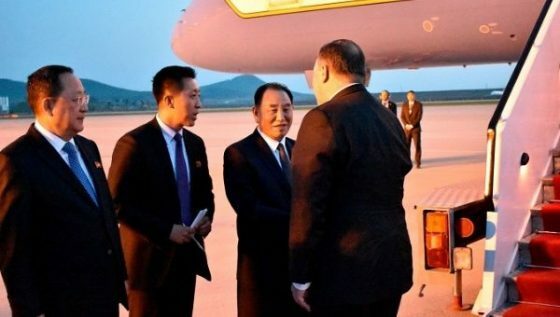 Secretary of States Mike Pompeo is meeting with 4 Star General and head of the military intelligence, Kim Yong Chol is a longtime spy chief and vice chairman of the ruling Workers’ Party was responsible for hacking Sony. More here. Then North Korea has 2 satellites in orbit and more planned in 2018-2019. “The surprise has been why North Korea has stuck with Scud propellants for so long,” Wright said. “There have been reports for 15 years now that North Korea had bought some submarine-launched missiles from the Soviet Union after it collapsed that used more advanced propellants, yet in all this time, we didn’t see them launch missiles with anything but Scud propellant. In 2016, At United States Strategic Command, controllers likely had a high-workload evening as STRATCOM monitored the launch of a Russian Soyuz rocket from the Plesetsk Cosmodrome just eight minutes prior to North Korea’s launch, as is typical for launches from Russia’s military launch site. The ascending Unha rocket was tracked using the Space-Based Infrared System in Geostationary Orbit, capable of detecting the infrared signature of ascending rockets from ground level all the way into orbit. This allows the U.S. military to track the vehicle’s trajectory in real time before relying on ground-based radars to track any objects that entered orbit. More here . Ah, but there is but one more issue at least. Yes, North Korea imploded their nuclear test site at Punggye-ri. But…there are 4 more locations. 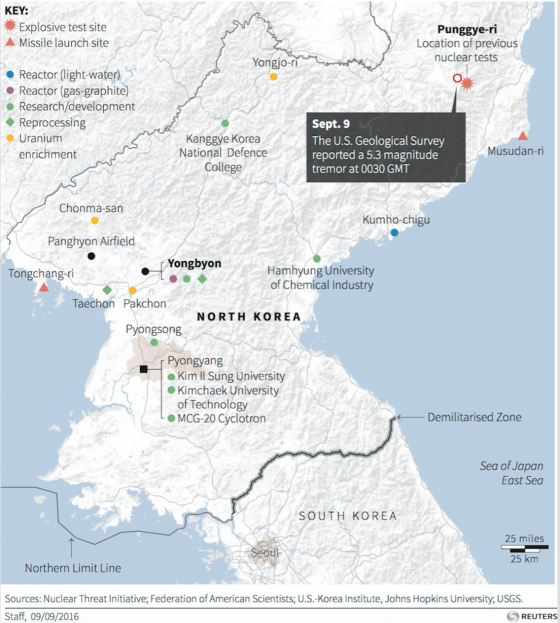 The most important is Yongbyon, while the other locations appear to have slight or no activity. Further, North Korea maintains a rather advanced air defense system, listed among the top in the world. However, while North Korean technology is relatively primitive — the nation’s air defenses are coordinated. Thus, while generally primitive, North Korean defenses might be a tougher nut to crack than many might expect. Moreover, while their technology is old, North Korea’s philosophy of self-reliance means it can produce most of its own military hardware. More here. North Korea has a fairly robust chemical and biological weapons program. The 46 page report is found here. Lastly, but hardly finally, is the cyber weapons produced and applied by North Korea. Most recently is: May 29, 2018, The Department of Homeland Security (DHS) and the Federal Bureau of Investigation (FBI) released a joint Technical Alert (TA) that identifies two families of malware—referred to as Joanap and Brambul—used by the North Korean government. The U.S. Government refers to malicious cyber activity by the North Korean government as HIDDEN COBRA. In conjunction with the release of this TA, NCCIC has released a Malware Analysis Report (MAR) that provides analysis on samples of Joanap and Brambul malware. NCCIC encourages users and administrators to review TA18-149A: HIDDEN COBRA – Joanap Backdoor Trojan and Brambul Server Message Block Worm and MAR-10135536-3 – RAT/Worm. While there has been recent discussions about applying the Libya model to North Korea for removing nuclear weapons, you can bet Kim Jung-Un is going to demand the Pakistan model.